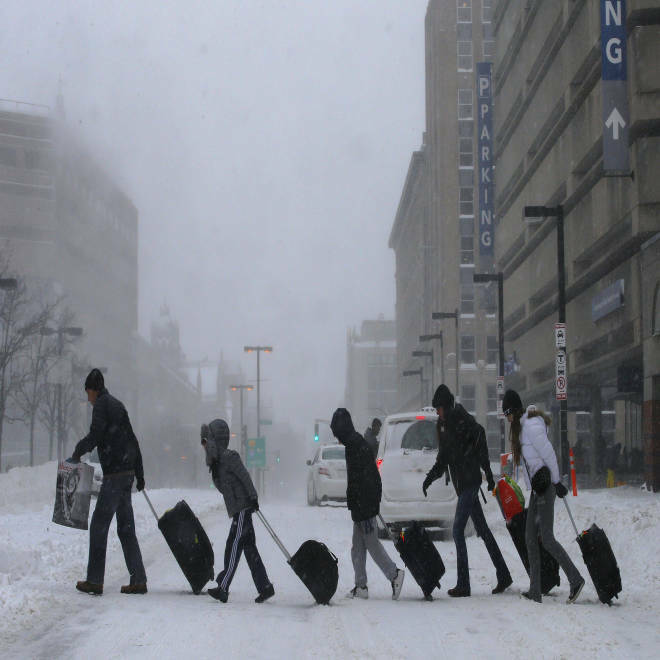 Travelers leave the Back Bay train and subway station Friday in Boston. A mammoth winter storm that built up on the Plains and plowed into the Northeast has affected millions of people in 22 states. 23.8 inches: The snowfall in Boxford, Mass., at 9 a.m., according to weather.com. 7.8 inches: The snowfall in Manhattan’s Upper West Side, according to the National Weather Service. 1.1 million: The number of students who got a snow day Friday in New York City, the nation’s largest public school system. 2,543: The number flights canceled nationwide, as of 3 p.m., according to FlightAware.com. More than 4,500 more were delayed. 41: The number of hours the brand new mayor of New York City, Bill de Blasio, had between his swearing in ceremony and his first emergency press conference. Other states transitioned leadership right before or in the midst of the storm. 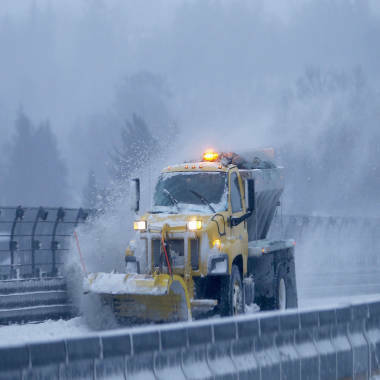 A snow plow clears the road along the New York State Thruway in Tarrytown. 3,379: Number of road crews clearing Massachusetts highways in the thick of the storm, according to Massachusetts Department of Transportation. 470,000 tons: Amount of road salt available to New York road crews to pre-treat roads, according to New York State Department of Transportation. 10 degrees: The temperature at which road salt becomes ineffective for melting snow and ice. 4 degrees: The air temperature in Rochester, N.Y., at 9 a.m. Minus 18 degrees: The air temperature in Green Bay, Wis., Friday morning, breaking a mark for the date recorded in 1979. Minus 34 degrees: The wind chill in Bangor, Maine, at 9 a.m.
65 mph: Recorded wind gust in Hyannis, Mass., according to the National Weather Service. 48: The difference between the temperature in Central Park on the first day of winter and Friday’s maximum temperature, which was not forecast to breach 17. The first day of winter was less than two weeks before Friday’s storm. 13: Lives lost as a result of the storm, according to The Associated Press.